As Alabama and Clemson play once again for all the college football marbles, this game in 2008 helped spark what these programs have become today. Most people who watch and follow college football could've never imagined what would happen to either team who participated in the first-ever Chick-fil-A Kickoff Game, played in the Georgia Dome in Atlanta on August 30, 2008. Alabama was the underdog against a top-10 ranked Clemson team. Looking back, it's hard to believe Alabama was an underdog in that game. The 24th-ranked Crimson Tide dominated Clemson in that game, 34-10. Later that season, the Tigers would fire their head coach at that time, which was Terry Bowden. Little did they know that his successor, Dabo Swinney, would be the coach to allow this program to burst onto the national scene. That year, the Tide went 12-2 in Nick Saban's second season as head coach, losing only to the 2008 national champions Florida and Utah in the Sugar Bowl that season. Clemson limped to a 7-6 record (ironically the same record Alabama had the year before), with Dabo Swinney taking over midway through the season. Dabo would later earn the full-time head coaching job. Fast forward a few years to January 2016. These two teams faced off again, this time for a National Championship. Clemson entered the game 14-0, while Alabama was 13-1. In what was a classic game, which included a second-half comeback by Alabama in part due to a gutsy onside kick, the Tide beat Clemson 45-40 to win the National Championship for the 2015 season. The next season, the two teams once again played one another for a National Championship. With Alabama leading 31-28 in the fourth after a Jalen Hurts touchdown drive, Deshaun Watson threw the game-winning touchdown pass to Hunter Renfrow to win the National Championship, 35-31, on the game's final play. That game marked the first time Nick Saban lost in a National Championship game. The two teams once again played in the 2017 season, this time in the Sugar Bowl, which was one of the two semifinal games last season. Alabama won convincingly in that game, 24-6, behind an interception and touchdown reception by defensive lineman Daron Payne. Alabama went on to beat Georgia the following week in a second-half comeback sparked by true freshman sensation Tua Tagovailoa to win the National Championship 26-23, in what went down as an instant classic of a game, won by Tua's pass to Devonta Smith on 2nd & 26 in overtime. 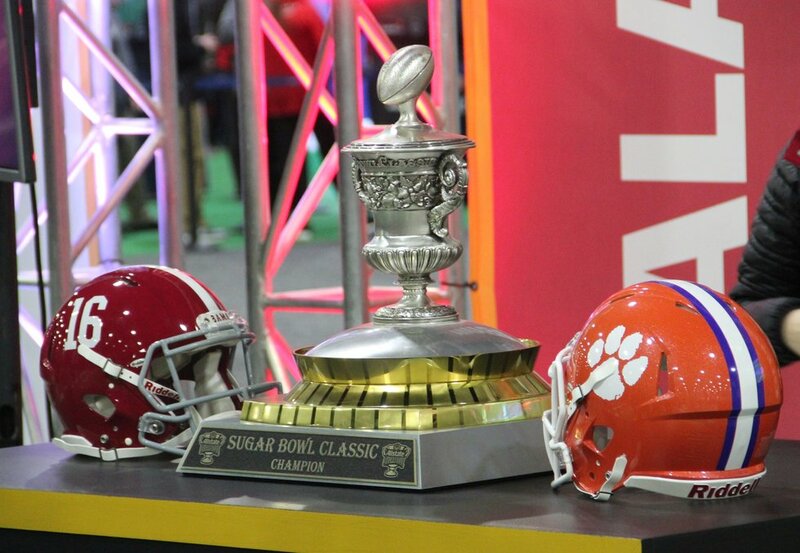 On Monday night, Alabama and Clemson will once again play for all the college football marbles. Both teams enter the National Championship in the California Bay Area 14-0, with the winner being the first team to win 15 games since Penn did so in the late 1890s. Both teams have dynamic quarterbacks and playmakers on each side of the ball. While I hope that the Tide will roll to victory, this matchup could go either way. Just imagine how different everything could've been for both teams had Clemson won that 2008 game against Alabama. Dabo would probably still be an unknown person, possibly taking a job at a lower tier program. Terry Bowden might still be the Clemson coach. Nick Saban might've had to take longer to build the dynasty he has built, with 5 national championships in 9 seasons. Clemson may not have even won the 2016 season National Championship. That game in the Chick-fil-A Kickoff Classic in 2008 helped launch both teams into the success they are currently seeing. Without that game, or even with a different result in that game, we might not have seen these two programs become as successful as they have.